I was recently sent some product info on a high end item. 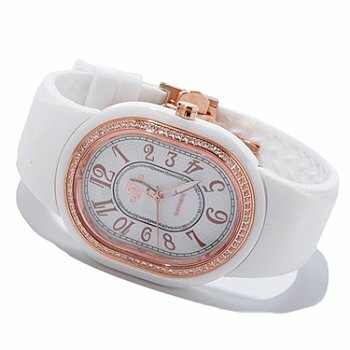 It's a beautiful accessory by Phillip Stein, a white ceramic watch. It's been advertised as the perfect summer watch for any barbeque, cocktail party, or summer wedding. Since it's a dual time zone watch, you can keep track of the time in two places at once- perhaps at your vacation destination of choice, and back home. 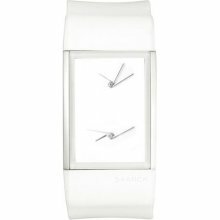 Because it's white and ceramic, it has a light and cool feel against the skin. The Natural Frequency Technology provides many supposed health benefits, including better overall well-being, increased focus, and improved sleep. So...while the watch is pretty, I wouldn't be caught dead paying $1600 for any accessory, so I decided to dupe it. Look familiar? It's the same watch, on Amazon, for $875. You can purchase it here. A. Take myself out to 73 really fancy dinners. B. Pay off one of my credit cards. D. Fill my car's gas tank up 26 times. E. Pay next month's rent and all of my utilities. F. Put a down payment on a new car. G. Buy 12 years of Birchbox. Because seriously, who spends $1595 on a watch? Which one is your favorite dupe? If I have that much money to spend on a watch, I have to much money! :P I actually prefer the look of the first dupe! 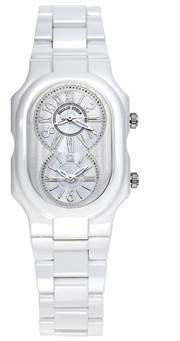 It's a pretty watch but not for $1600! Or even the $875 on Amazon. 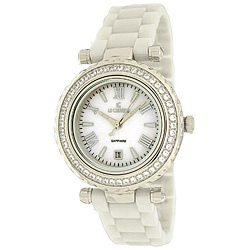 I'd go with dupe #2 if I was looking for a similar watch!